One of my favourite ways to use just a handful of fruit is to cut them up and throw them onto a pancake. To me it’s just a bit more special than gobbing them down. Of course, unlike posed cooking photos strawberries cooked this way go a bit limp. … but they taste super yummy! Thanks to my friend M who told me to pick some of her strawberries when I dropped by yesterday. It happens every year, after a summer of tending plants through stinking hot days, you wake up one day and the overnight temperature has dropped and those tomato bushes are past their best. Well that’s where it starts. About a week ago we did decide to pull out the spent tomato vines and in the time-honoured way it has led to job after job in the garden. Once the tomatoes had gone the rest of the bed needed to be cleared of weeds. Then it was clear that the whole bed needed re-aligning to rectify some long-forgotten design decision we made years ago. 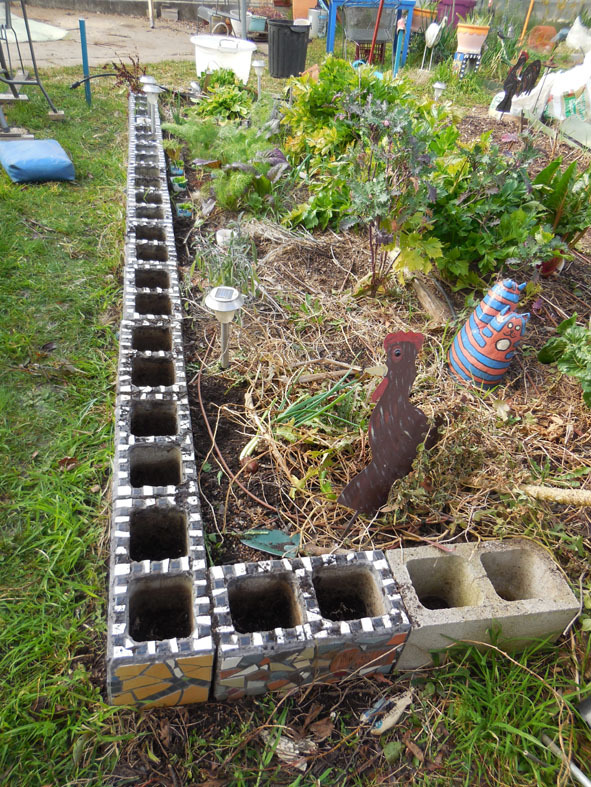 Thankfully our garden beds are not permanent, so up came the concrete block edge. Three days in and all the strawberry and sorrel plants that lived in those concrete blocks were transferred temporarily into tubs so the blocks could be re-laid. 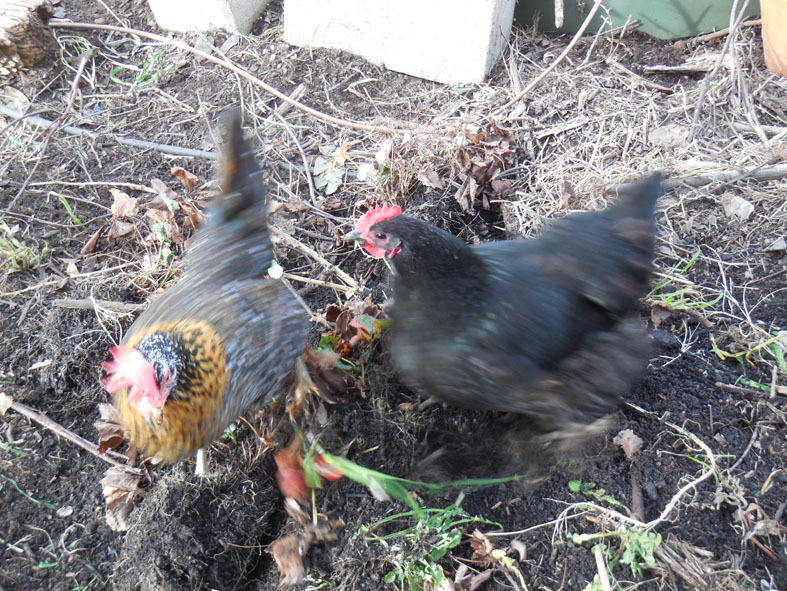 In the interim one of the chooks offered ‘assistance’ by eating the one sorrel plant remaining in the main part of the garden down to it’s roots. Then it was off to the tip to buy a trailer load of compost. I’ll skip over the hard work of shoveling soil etc, because I was lucky enough to avoid that task. I injured my shoulder some days earlier, (the other half did an excellent job of the task). PS defences were broken through, but we are retaliating with bigger and better defences. Picked some strawberries at my friend’s place. Now turned into strawberry jam. Hi! It’s been a long while since I last posted because we were traveling overseas. Since we’ve been away spring and even an early dose of summer have seen most of our veggie garden leap from edibility to seediness. The asparagus has yielded it’s last spears, at least our house sitter got the benefit of most of them. 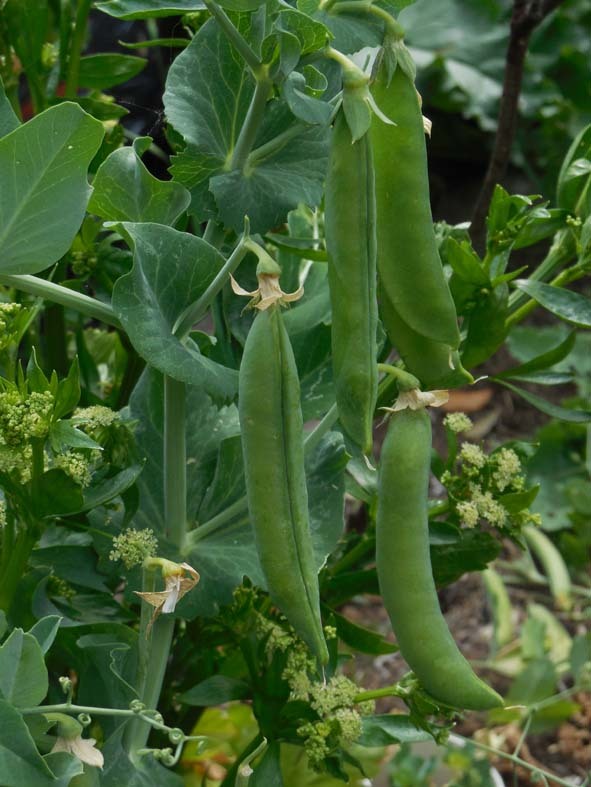 The peas are producing lots of pods, but it’s not obvious whether we can encourage further podding or will have to make do with the current yield. The peas are podding beautifully. The strawberries have struggled with the early hot weather and the berries have literally dried on the plants. At least with this past weekend’s rain I’m sure they will come good again. We have been pleasantly surprised to find that both our perennial mountain yams that we put in last year have actually done what they should have and are re-sprouting. One had started growing before we went away and it’s already making it’s way into the lower branches of a nearby wattle tree. Mountain yams, off their support and into the tree. The other has only started re-growing in our absence, but I’m thinking that we may need to provide an even higher support for it to climb on. Hopefully this means we might get some useable tubers this year. So now we look forward to some major pulling out of old plants and planting summer crops of tomatoes, beans and corn. I mentioned before that I was going to rebuild my strawberry beds .. and I have! Like so many jobs it turned out to take a lot less time than I had anticipated. 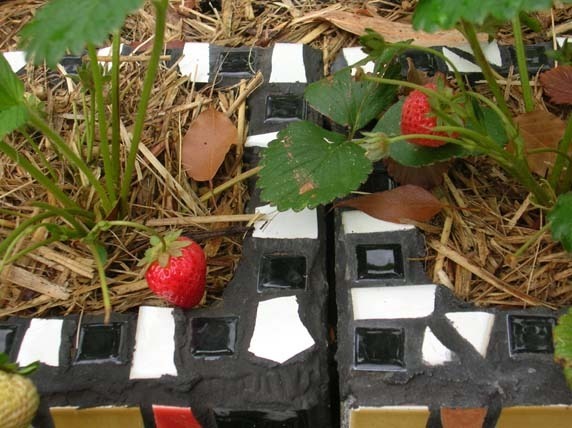 With the strawberry roots taking up all the space in the holes in the bricks, the old plants could be pulled out in one go. Per usual I took the plugs down to the chickens who spared no effort in ripping them apart for the snails, worms and slaters hiding in the soil. 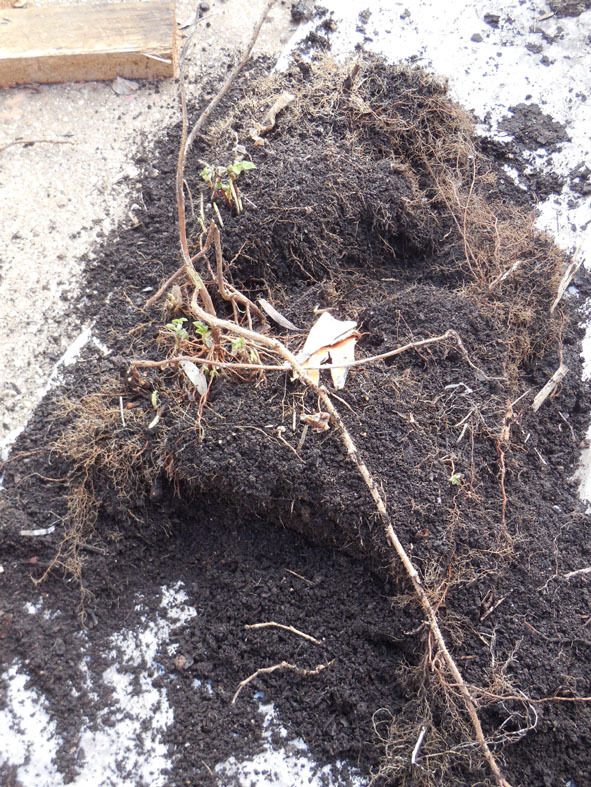 I collected what was left of the plants, sorting out useable runners from the diseased older plants. The diseased plants got thrown in the bin. 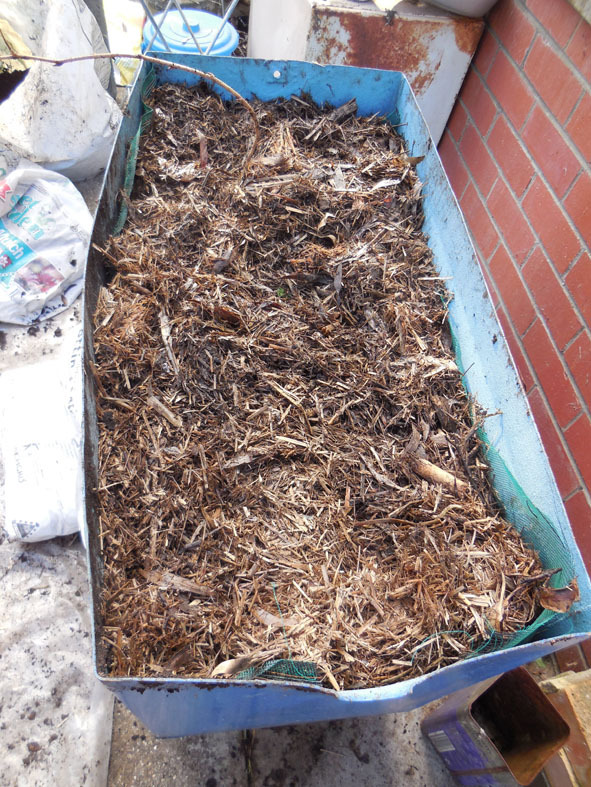 There is no value in composting them as the diseased leaves could spread viruses around the garden. Never stand between a chicken and it’s food! 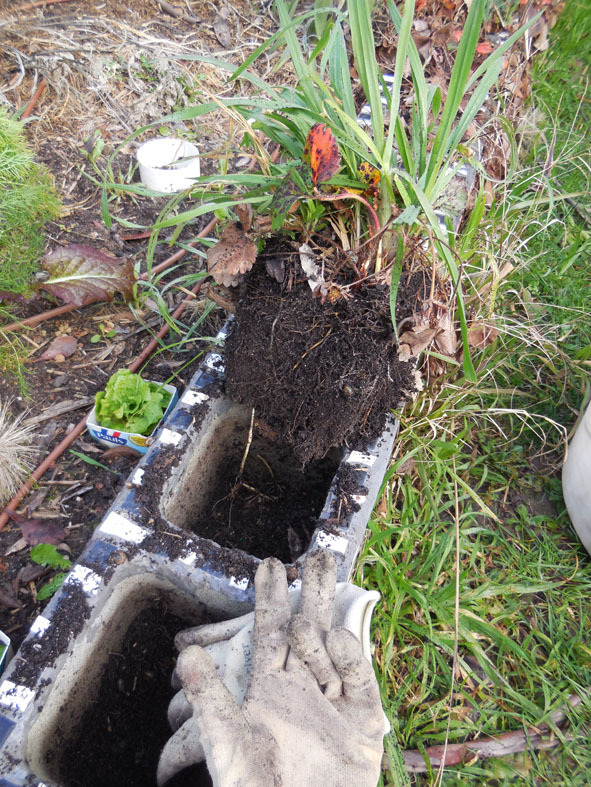 Once the plants were gone I mixed some leaf mould, rotted cow manure and potting mix to replace the old soil. All cleared out and ready for the new soil. Then the fun part, replanting ready for the new season. 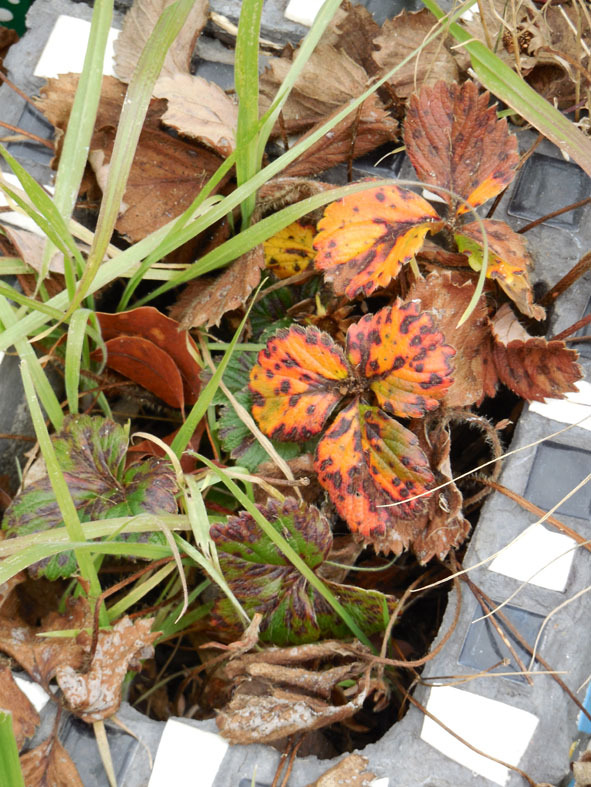 Only a few metres away it was clear that the raspberry plants were in similar need of re-potting. If you look closely you can just see the new seasons green shoots peeking through. The raspberries are in a bad way. 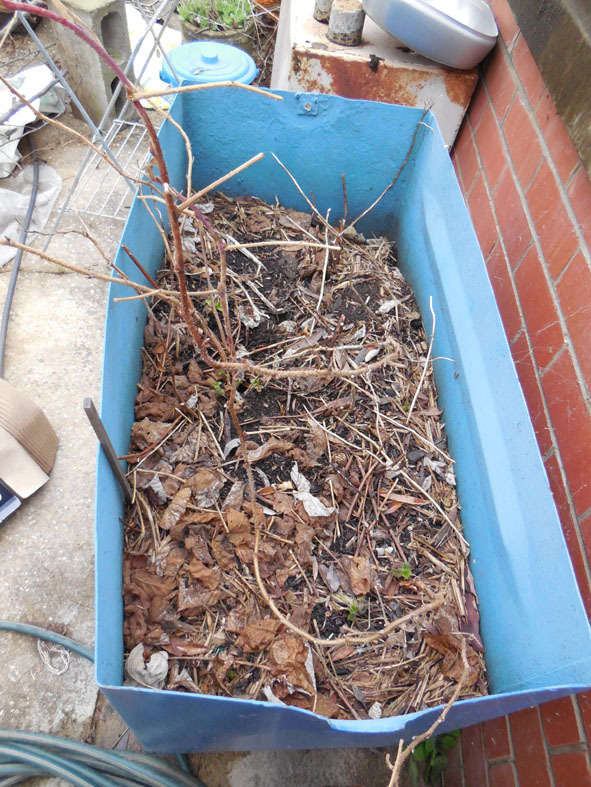 When we pulled the raspberries out of the container we realised that lots of the soil we had put in the container over the years had washed down below the false bottom in the container. We decided to split the plant into two as all the space in the existing container was taken up. Luckily we have the other half of the container, a former heating oil tank, which we will also convert into a tub. 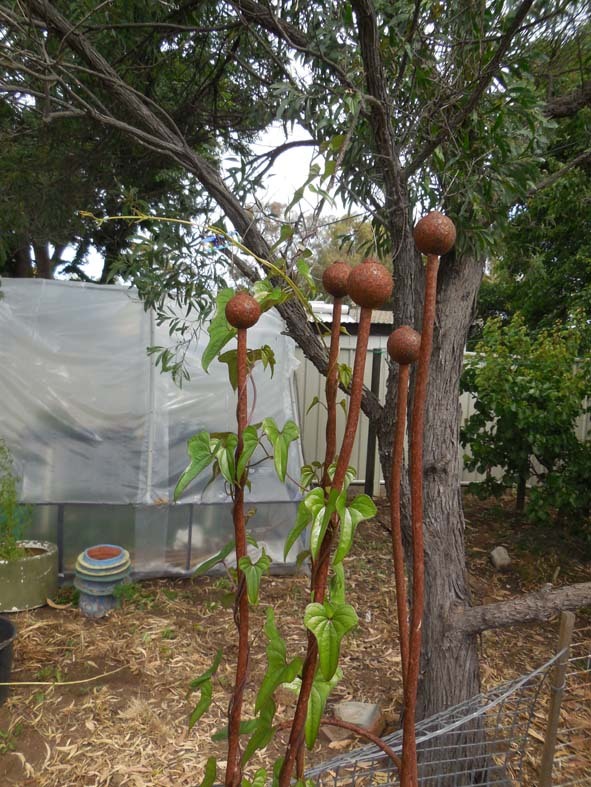 One of the unfortunate results of the re-potting was a lot of damage to the few canes which would have borne fruit this year. However, we think it will be better for the plants to develop new canes rather than worry about getting fruit. Back in the tub and hoping for lots of new growth. Spring is nearly here, just under two weeks to go until the official start of the ‘growing’ season. The wattle is flowering, the chickens are laying more consistently (well at least two of them are), the days are getting longer and most incontrovertible of all, I have an overwhelming urge to go to the nursery and spend up big on any plant I see. 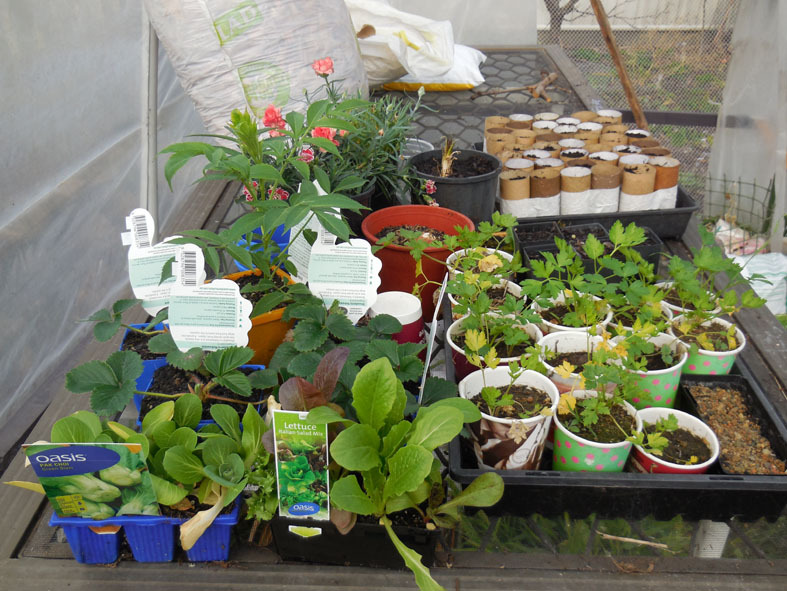 Newly bought seedlings and some early seed propagation in the polyhouse. I’ve found it all so hard to resist. We gave in last week and bought a few punnets of plants, pak choy and lettuces, that will be able to survive in the current low temperatures and will survive the inevitable frosts. And yes, at the back, that is a tray of pea seeds that I planted in their traditional loo roll tubes, yesterday. By the time they are up they will be well able to cope with the outside temperatures. Parsley, at the front, was transplanted from tidying up in the front veggie garden. Most of these are destined for give-aways to friends and neighbours. I am also trying to be a bit more logical in assessing what we have in the garden and what we need to source for the garden. A case in point are the strawberries. Our current crop are well past their use-by date as can be seen in the spotty, virus laden foliage. These have to be rooted out, quite literally and replaced. 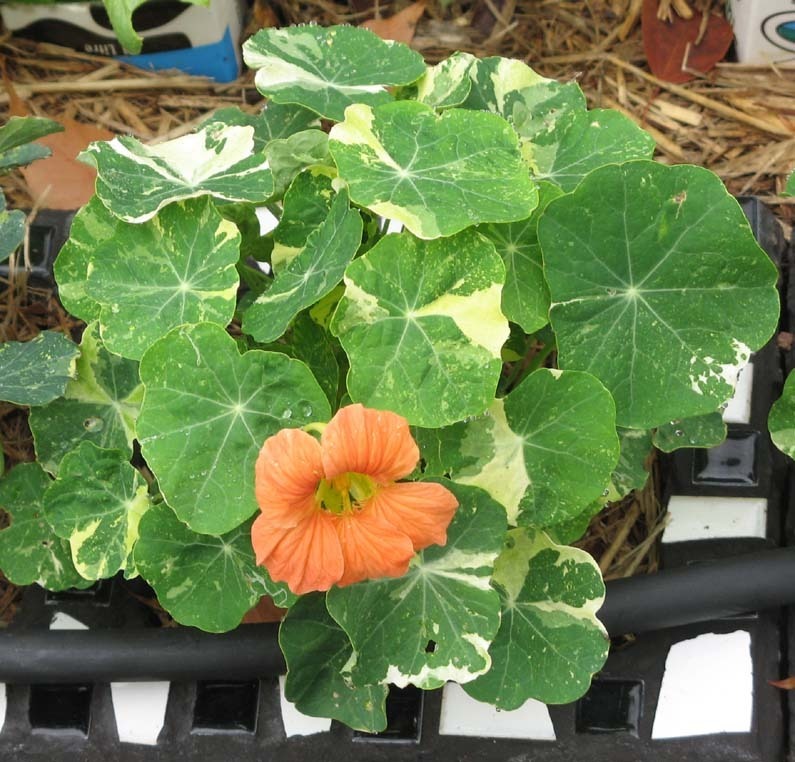 I have some previous years runners in pots, but I still have to check whether they are clear of viruses. I did buy four new plants of the strawberry variety Hokowase, which originated in Japan and friend M says she will give me some of her runners. So once I wrestle with digging out the old plants, tossing them in the bin to avoid any further infection and replacing the soil in the brick niches I will be able to replant. I’m working off, or perhaps working up, my spring gardening urges by reading gardening books and listening to gardening podcasts. 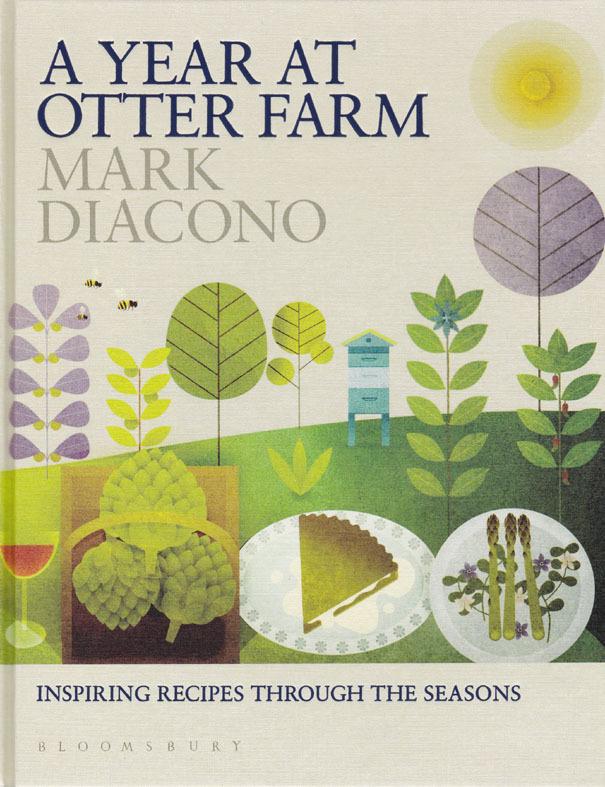 Top of the reading list at the moment is A Year at Otter Farm, by Mark Diacono (Bloomsbury Press 2014). A year at Otter farm, cover illustration by Andrew Lyons. Yes, I was sucked in by Andrew Lyons’ beautiful cover illustration, but equally so by the fact that Mark has a recipe for Jerusalem artichoke cake. Anyone who grows these yummy tubers will know that, like zucchinis, you can never have too many recipes for using them all up! This book ticks all my boxes. It’s seasonal, the recipes are sorted by main ingredient and the recipes are sensibly listed on the page where the vegetable is discussed. Such an obvious idea and yet I think this is the first time I’ve seen it in use. Mark is also growing some of the less common veggies and it’s great to get his growing tips and learn from his experience. While Mark is living in the UK it is easy enough to follow the seasons through the book by simply ignoring the month listed at the chapter heading. I’m also going overseas for my favourite podcast over at You Grow Girl. Gayla Trail’s blog (Gayla is based in Toronto, Canada) was one of the first gardening blogs I found all those years ago. I must say that I had not been catching up with it recently so I was pleasantly surprised when I dropped by the other day to see that she is now podcasting. Her podcasts go under the title of What’cha Growin. I like what she is doing – I’ve listened to four podcats so far – Gayla has some really interesting guests. 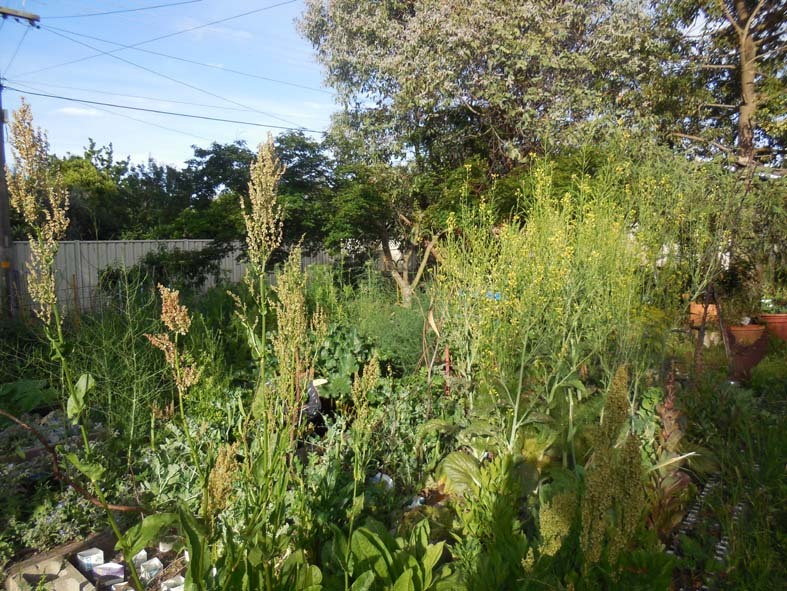 Some are experienced, others raw beginners from both rural and really urban gardens – have you ever had a gunshot victim laid in your garden while waiting for the ambulance? I’ve been really disciplined starting from her first podcast, but I’m building up to episode 7, when she interviews Alys Fowler, one of the UK’s leading veggie garden promoters. Bring spring on, I’m ready! I’ve been quiet for the past few weeks because we have been traveling in Japan, where the seasons are noted and celebrated in daily life and the food people eat. 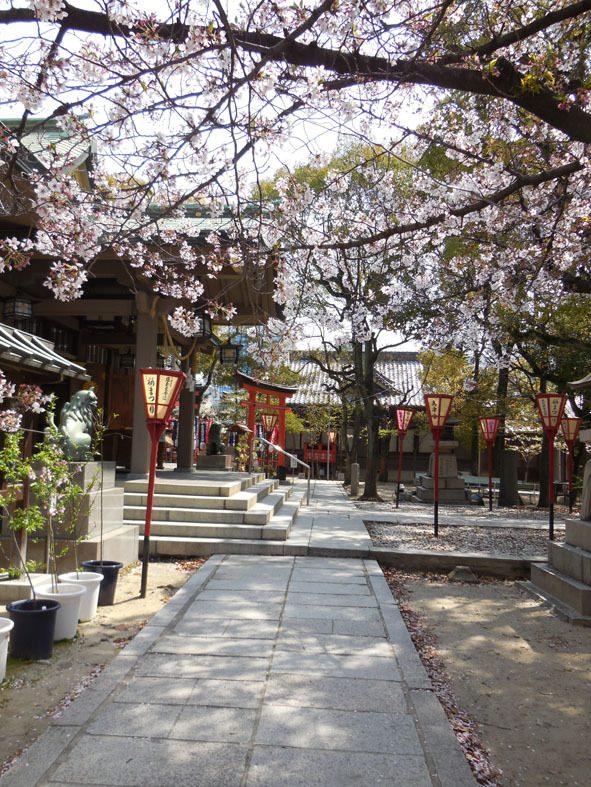 It was spring when we arrived in Japan and that means one thing, even to non-Japanese, it was cherry-blossom time (in Japanese, sakura). 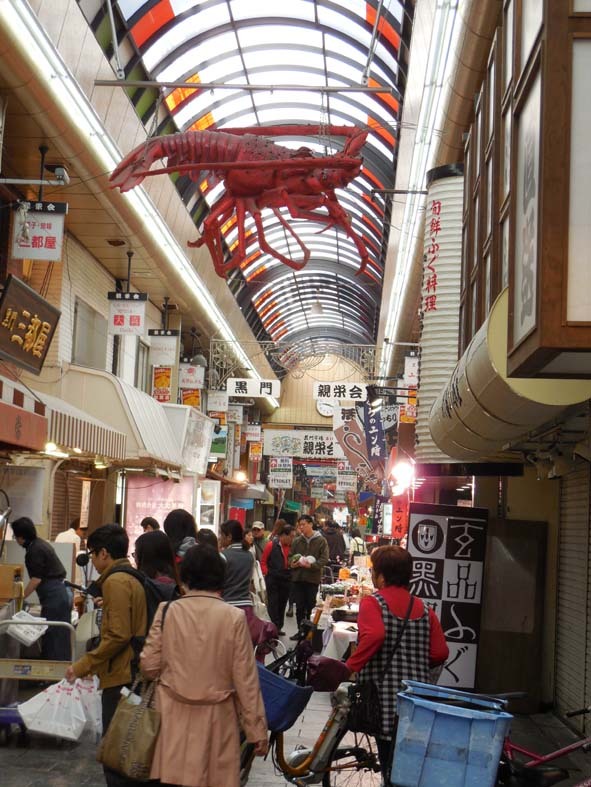 On our first morning, following breakfast in a local coffee shop, we found that we were just across the road from the Kuromon Market. Oh for something of this quality in Canberra. 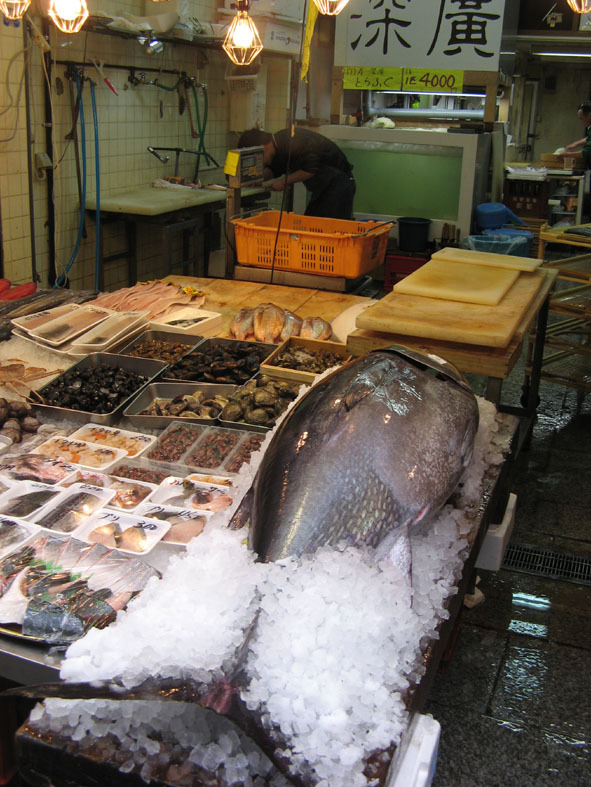 In the local market, in the seafood aisles, near Dotombori, Osaka. A large tuna was attracting plenty of browsers to this shop. and other displays that we were rather less enthusiastic about. 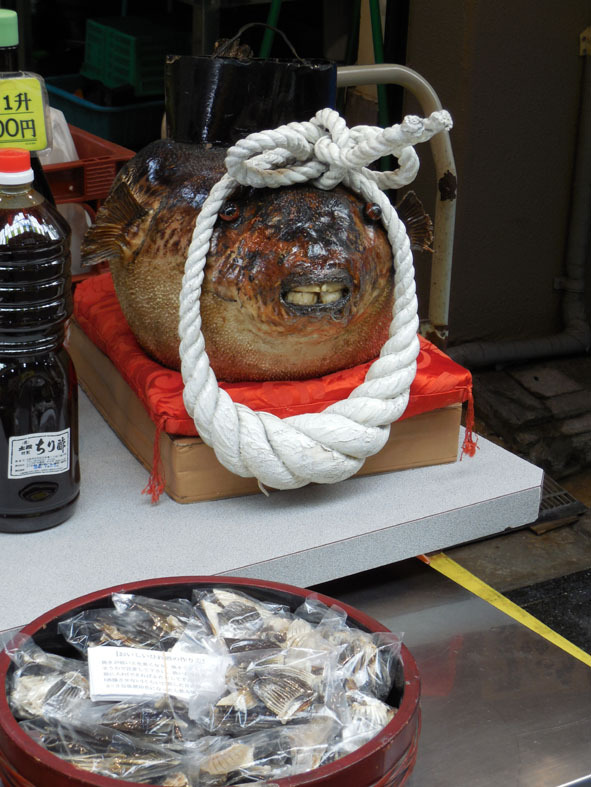 Show some respect, the potentially deadly fugu fish. This led us to the fruit and vegetable section of the market. It turned out that strawberries were in season. 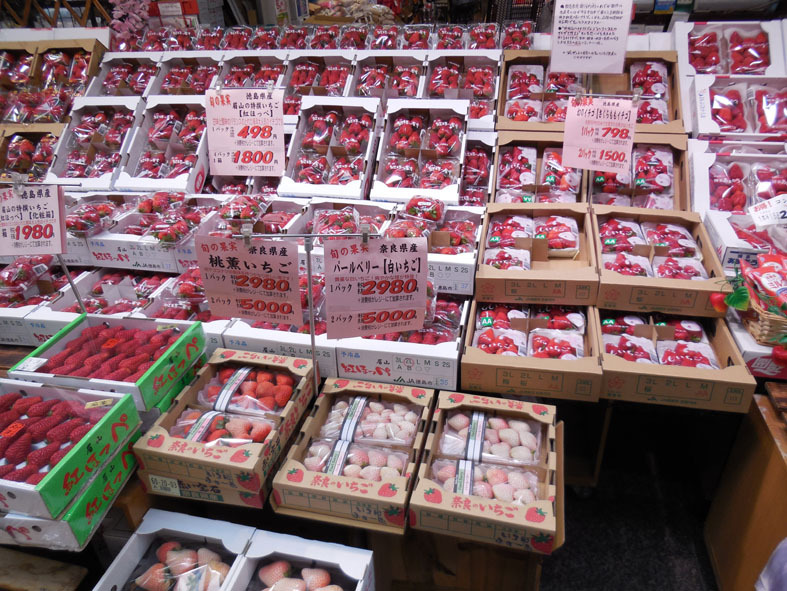 It is not unusual to see stalls in Japanese markets that have such large displays of a single item of produce in season. 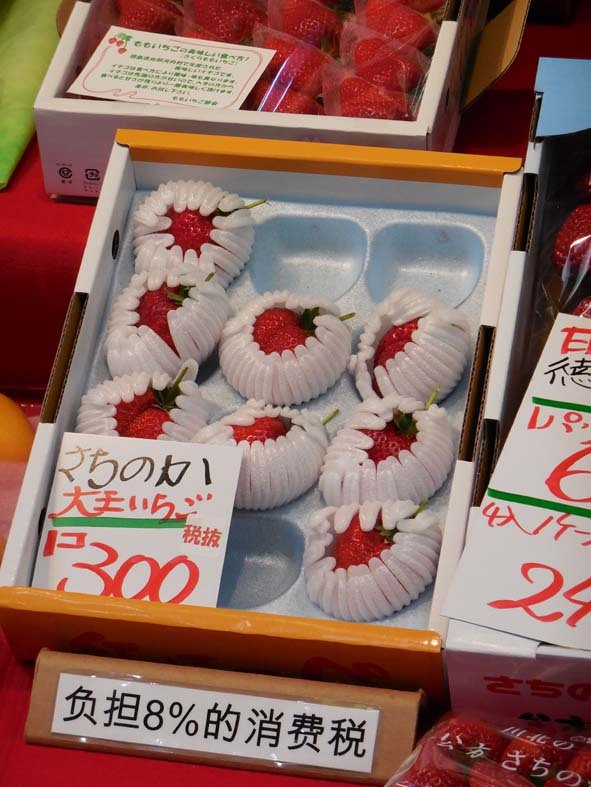 A stall of strawberries. At the front are boxes of ‘white’ strawberries. The more expensive fruit was individually wrapped. Individual strawberries. Asking price, roughly $A3 each! 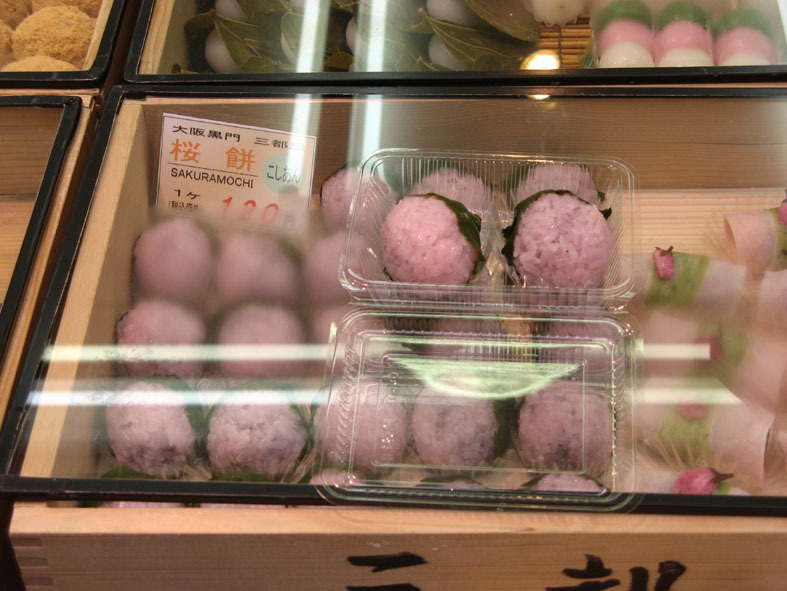 To celebrate the spring season there were also stalls selling sakura mochi, a pink-tinted rice ball around a centre of red-bean paste and wrapped in a pickled cherry leaf. 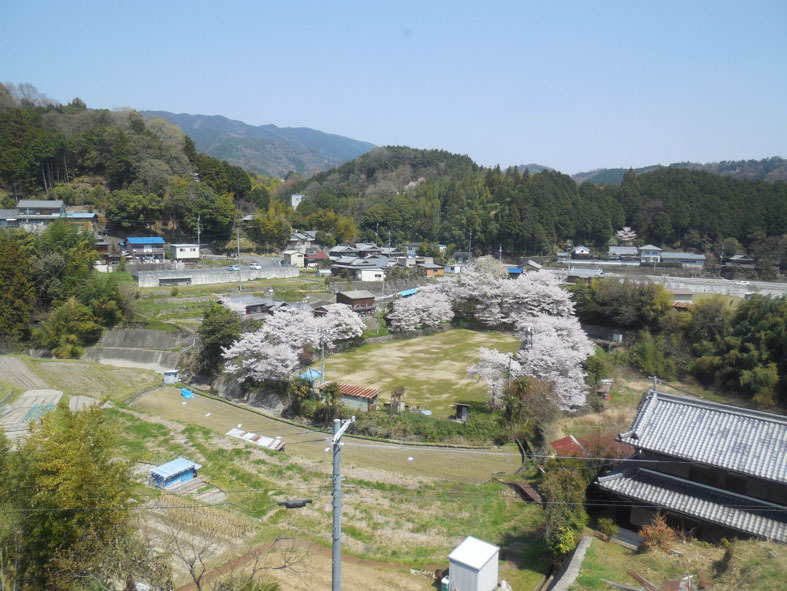 Sakura seen from the train. We are now hovering between the spring harvest and the summer plantings. TB has just harvested our garlic. There are not as many heads of garlic as last year – we did get a bit carried away there – but there is sufficient to get us through well into the new year. 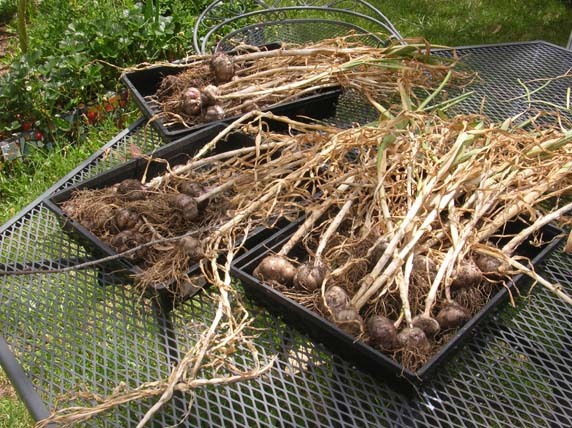 Garlic harvest drying prior to storage. Where the garlic was growing is where the first of our tomatoes will be planted. Although the gloss has worn off the annual Canberra tomato challenge with the news, reported in the pages of The Canberra Times, that one gardener in the suburb of Campbell, has already harvested his first bush-ripened tomato! Infamous! 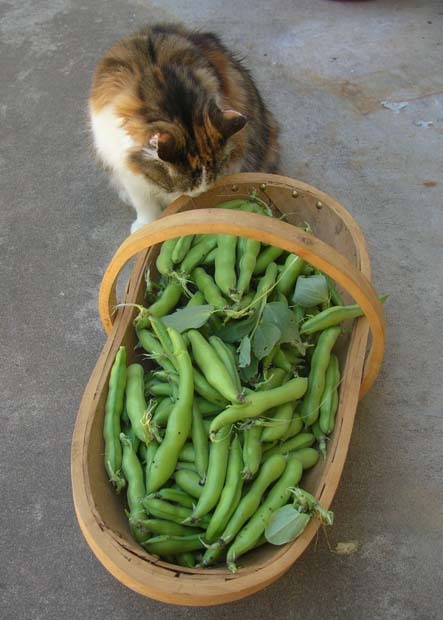 We continue to harvest good quantities of peas and broadbeans. For once I’ve been picking pods of both plants frequently which has helped with maintaining the production of pods for as long a period as possible. What we are not going to eat straight away is blanched and frozen for future use. Of course our cat, not to mention one of our close friends, cannot see why we bother to eat them at all! Can you believe that my humans actually eat these things! I am happy to say that my strawberries are already producing a steady amount of fruit. I enjoy being able to pick a juicy handful of strawberries to eat as I potter my way around the yard. As I look around the garden I’m starting to see small signs of movement towards spring. 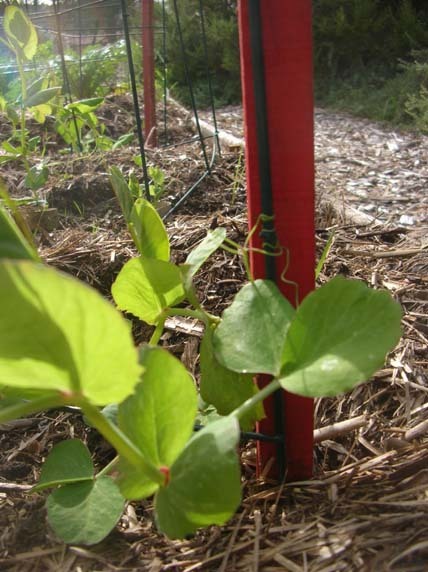 The first new shoots on the raspberry canes and my Purple-podded peas finally starting to twine up their supports. We have also seen the first signs of pardalote’s checking out our newest compost pile for a nesting site. 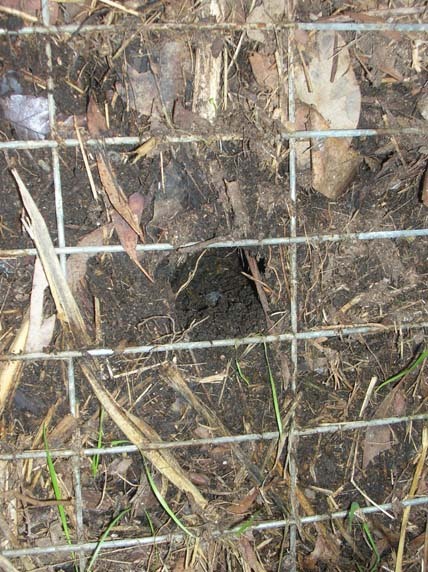 Oh well another year without being able to access the compost. We’ll just have to start a second heap as the pardalote’s are just too precious to evict. 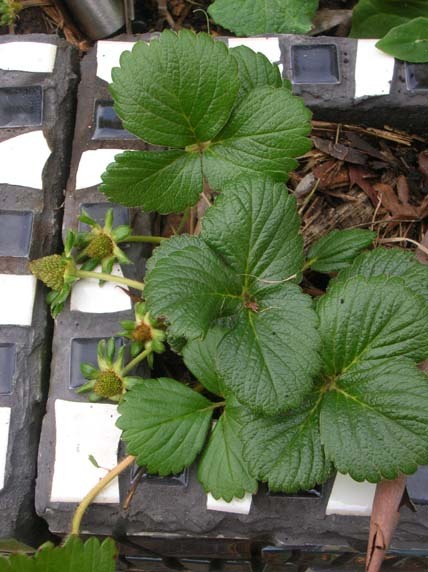 I’ve even indulged in that most arcane of gardening activities, pruning the dead leaves off my strawberry plants – it does help remove potential sources of viral infection. I even discovered that in spite of a week of below zero minimum temperatures some of my strawberry plants are trying to set fruit! A bit too early for success I suspect. Strawberry plants getting a bit ahead of themselves in late July. I love colour in the garden, something most of you regular readers will know. This time it’s not purple I’m praising, but red. 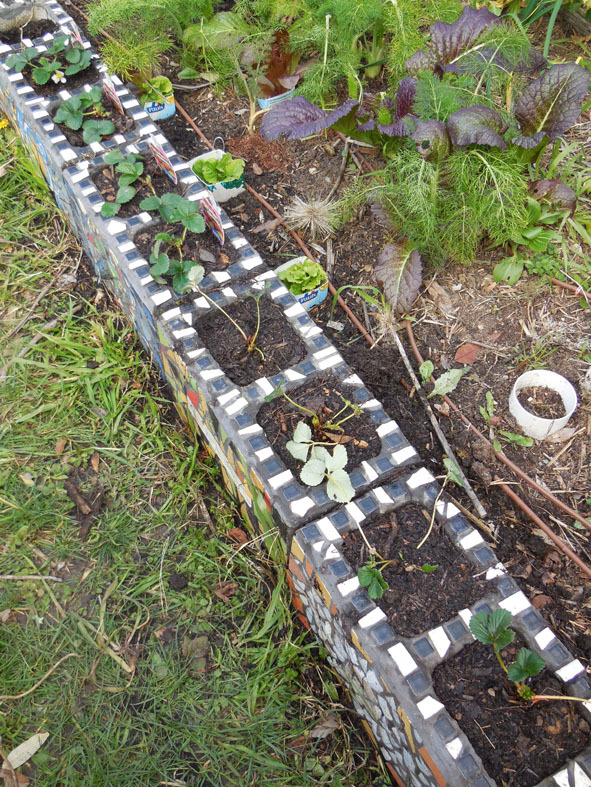 Of course there are the strawberries looking very decorative against the new mosaics. 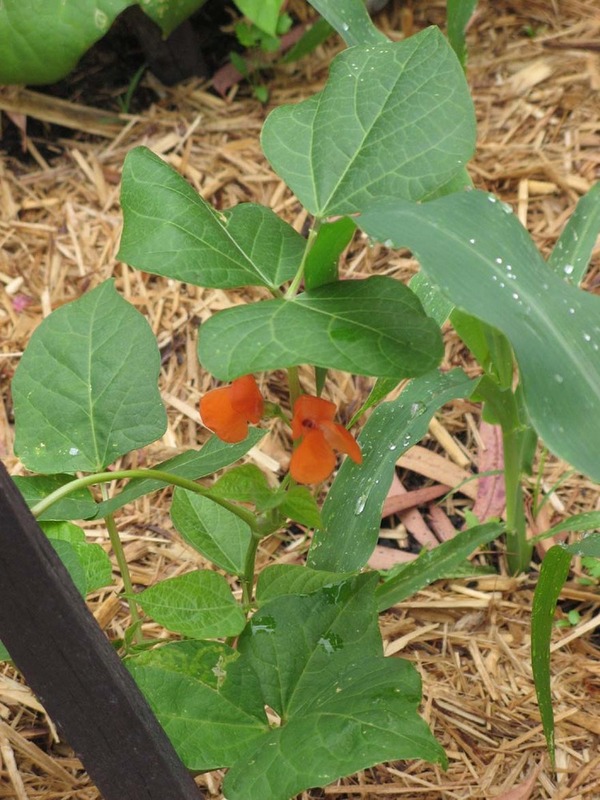 Then in the ‘three sisters’ garden bed, my scarlet runner beans are flowering. Hopefully plenty of beans will follow. OK these nasturtiums are more red-ish than red, but you don’t want to muck up a good theme! 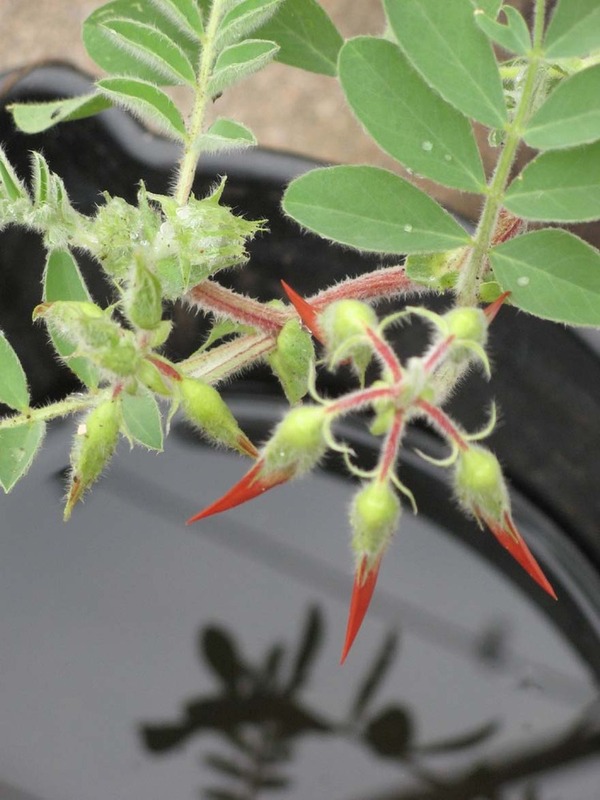 And last but certainly not least we are having amazing success with our Sturt Desert Peas. Grown from seed we bought in Broken Hill two years ago, we are desperately trying to ensure that the snails don’t find them before the flowers are fully out.